There are 45 Assisted Living Facilities in the Louisville area, with 35 in Louisville and 10 nearby. The average cost of assisted living in Louisville is $3,671 per month. This is higher than the national median of $3,346. Cheaper nearby regions include Jeffersonville with an average starting cost of $3,300. To help you with your search, browse the 221 reviews below for assisted living facilities in Louisville. On average, consumers rate assisted living in Louisville 4.3 out of 5 stars. Better rated regions include New Albany with an average rating of 4.3 out of 5 stars. Caring.com has helped 22 families in Louisville find high-quality senior care. To speak with one of our Family Advisors about assisted living options and costs in Louisville, call (855) 863-8283. Louisville, Ky., is known for attractions like it's award-winning bourbon distilleries, Churchill Downs Racetrack, Louisville Slugger Museum and Factory and Muhammad Ali Center. Seniors will find so many things to do in Louisville with friends from their assisted living communities. There are 46 assisted living facilities in the Louisville area. Of these, 34 are in the Louisville city limits, and 12 are located in nearby areas, including Goshen and Lyndon. These facilities offer seniors support with the tasks of daily living. The air quality in the Louisville area is 7 percent poorer than the national average. According to the American Lung Association, the Louisville/Jefferson County area ranks number 21 on the list of U.S. cities most polluted by year-round particle pollution. This poses health risks to people with lung or respiratory problems. Louisville, KY, has quite a high crime rate in comparison to the rest of the state. The violent crime rate in Louisville is around 7.3 per 1,000 residents compared with the rate of 2.3 per 1,000 citizens for the state of Kentucky. Fans of the arts will find many places to visit in Louisville. The Speed Art Museum features a huge collection of works from throughout the ages, and seniors who visit receive a discounted entry fee. The Louisville area is home to world-class medical facilities, including the University of Louisville Hospital and the Baptist Health Hospital, in the event of medical emergencies or illness. Louisville is a member of the AARP Network of Age-Friendly Communities, meaning that its elected leadership “has made the commitment to actively work toward making their town, city or county a great place for people of all ages,” according to AARP. Louisville has an array of community resources for seniors, including the ElderServe Senior Center, an organization that helps seniors meet new people and engage in a range of fun activities, as well as 14 other senior centers. Assisted Living costs in Louisville start around $3,671 per month on average, while the nationwide average cost of assisted living is $4,000 per month, according to the latest figures from Genworth’s Cost of Care Survey. It’s important to note that assisted living rates in Louisville and the surrounding suburbs can vary widely based on factors such as location, the level of care needed, apartment size and the types of amenities offered at each community. 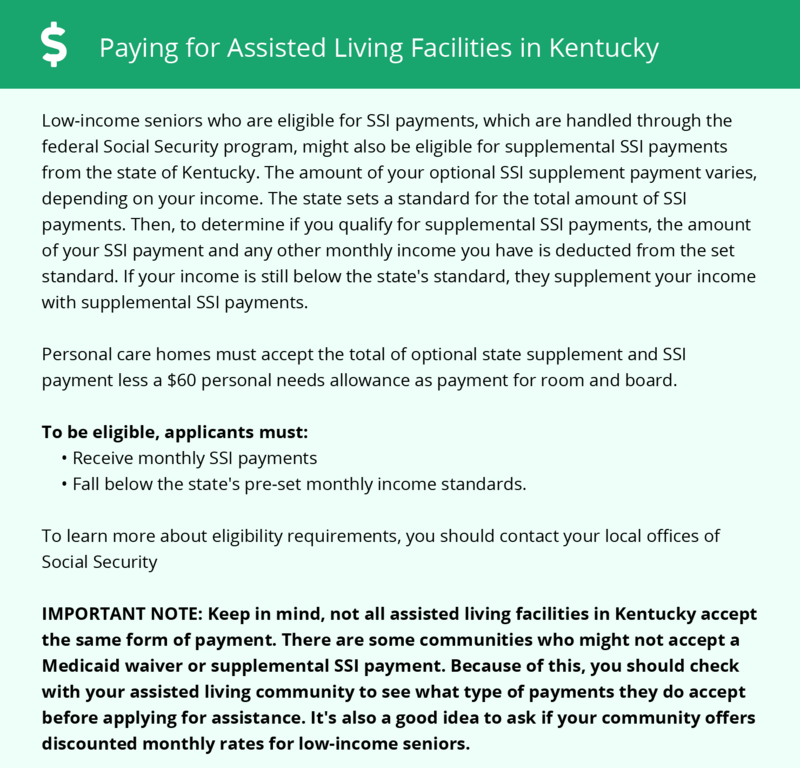 In the state of Kentucky, assisted living facilities don't provide health services and therefore are not eligible for funding through Medicaid. However, in some circumstances, Medicaid may provide coverage for treatments received from an outside agency. Louisville and the surrounding area are home to numerous government agencies and non-profit organizations offering help for seniors searching for or currently residing in an assisted living community. These organizations can also provide assistance in a number of other eldercare services such as geriatric care management, elder law advice, estate planning, finding home care and health and wellness programs. To see a list of free assisted living resources in Louisville, please visit our Assisted Living in Kentucky page. Louisville-area assisted living communities must adhere to the comprehensive set of state laws and regulations that all assisted living communities in Kentucky are required to follow. Visit our Assisted Living in Kentucky page for more information about these laws.